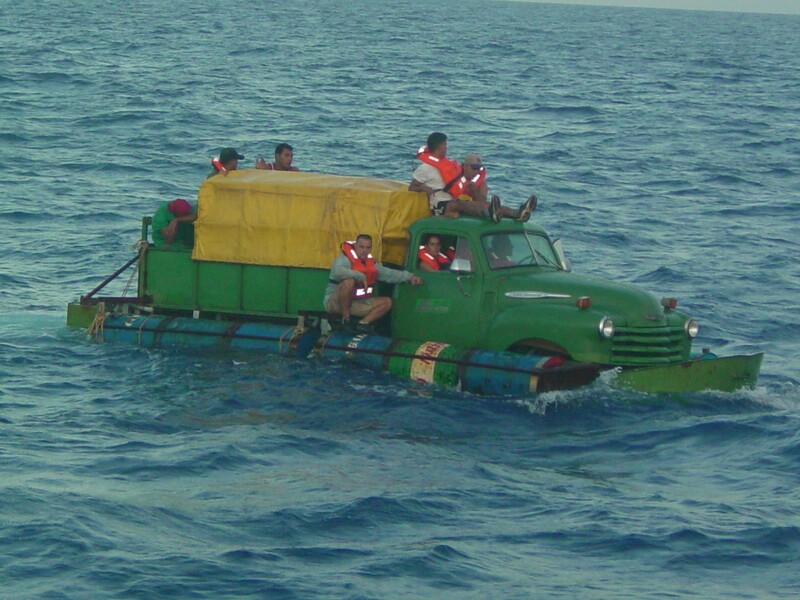 This page is dedicated to the ingenuity and entrepreneurial spirit of the various Cuban refugees who have attempted to sail to the United States on homemade vessels cleverly crafted from old American cars. Unfortunately, often they have been caught before reaching American soil, and returned to Cuba. Here's to you, floating Cubans! Your cleverness and your persistence inspire me. May you all achieve your goal, and finally reach the land of McDonald's, Disney, and Coca-Cola. The original attempt at reaching the United States was done with a converted 1951 Chevy pickup truck on July 16, 2003. The truck's drive shaft was attached directly to a propeller and the craft could reportedly reach a leisurely 7 knots (8 mph). 55-gallon oil drums were used for flotation. 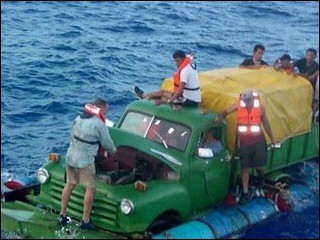 The dozen or so Cubans in the truck were caught just south of Key West after being sighted by a U.S. Customs aircraft. Starboard side of the truck raft. Photograph taken by the U.S. Coast Guard. Click the image for a larger version. Back view of truck raft, showing spacious cargo capacity. Closeup of the truck raft from the front, showing one of its passengers checking the engine under the hood. Another side view of the truck raft. 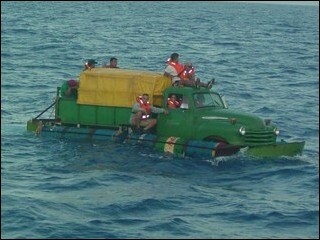 This valiant and ingenious attempt at fleeing Cuba earned the original crew the proud title of camionautas (truckonauts). 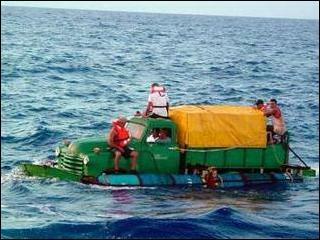 Unfortunately, instead of being rewarded for their cleverness, the Cubans were repatriated back to Cuba. 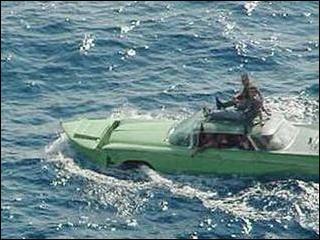 Sadly, the pickup truck was also later sunk (reportedly through the copious application of machine-gun fire!) by the U.S. Coast Guard. 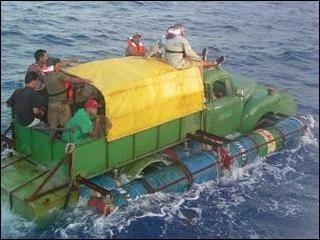 Here are links to some news stories and notable websites mentioning the original Cuban truck raft. Balloon Juice - America or Bust! In early February of 2004, three of the original truckonauts made a second attempt to reach Florida. Their new, more sophisticated vessel, with a passenger complement of eleven, was crafted from a 1959 Buick: the interior was welded to be watertight, the prow of a boat was attached to the front of the car, and, amazingly, the car was fully functional and still had its tires. Their audacious plan was to reach landfall in Florida, discard the boat parts, and drive to a relative's home in Lake Worth, FL. There's something about this second attempt that just makes me smile. I guess it warms my soul to think that if you're going to make a desperate seaward journey to flee your homeland, you can still do it in style, and with your hearts full of hope. canf.org - Cubans trade in pickup for Buick on trip to U.S. This particular ocean-crossing had a happier result for its intrepid passengers. 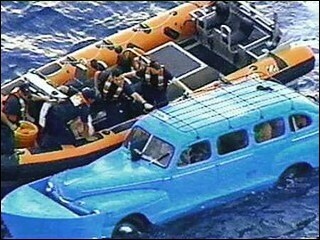 After a lengthy stay at Guantanamo (during which master mechanic and original truckonaut Luis Grass, who created the original truck raft in 2003, reportedly longingly eyed various military trucks as potential conversions), a group of 20 Cuban migrants, including Grass and his family, was granted passage to relative freedom in Costa Rica. Let's all raise a mojito to honor Luis Grass and his family for their persistence, bravery, mechanical aptitude, and sheer chutzpah. ¡Bravo! Not to be outdone, Rafael Diaz Reyes, another of the original truckonauts, made another attempt at U.S. landfall on June 8, 2005. His craft, a converted 1949 Mercury station wagon, appears to follow the design of the second-attempt 1959 Buick car boat. It carried 13 people and was stopped at the usual area just off Key West. The Mercury was apparently originally a taxi. Driver! To Florida, and hurry! 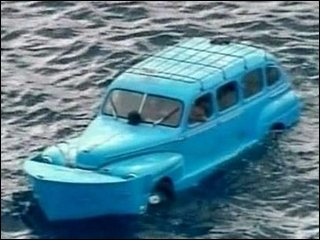 Here are links to some news stories and notable websites mentioning this most recent Cuban taxi-turned-boat. The fate of this most recent group of truckonauts is at this point uncertain. Their families are calling on the U.S. to provide them political asylum. Please e-mail any suggestions, corrections, or pointers to additional information and photographs to Andrew Ho (webmaster@floatingcubans.com). Disclaimers: Border protection and immigration policy are complicated issues; this page just recognizes the spirit of the truckonauts who took brave and clever steps to take matters in their own hands. It is not the author's intention to violate any copyrights. Please contact me if there are issues with images or quotes on this page.